Although I lived in the house from the age of 2 until I was almost 10, I have very few vivid memories from our house on Kensington Lane in Celina, Ohio. But one very vivid memory I do have is of when my big brother, Mitch, let us know he was going into the Army. Mitch sat in a chair at the kitchen table, and said he had something to tell us. He even asked my mom to sit on his knee as he told us. He knew her reaction would be one of worry and fear. Mitch then explained that he was entering the service. He had signed up for the U.S. Army. I don’t remember anything after that, except that my mom and I both cried. I think my mom was probably happy and sad. I was mortified. All I knew of the military was what I had seen in movies, and that usually involved combat in war. 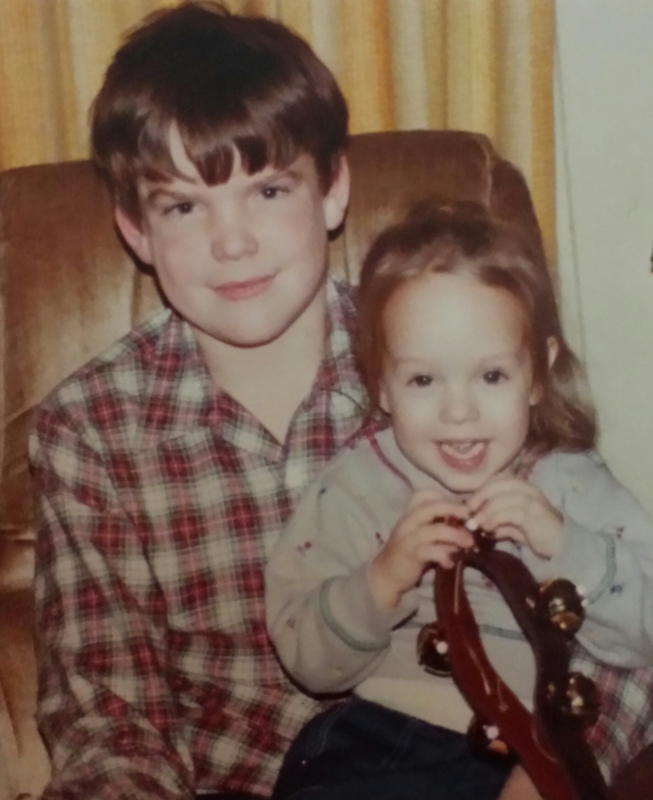 Although my big brother was ten years older than me, we were close. I looked up to him, and wanted nothing more than for him to be safe. Mitch went to bootcamp and was shifted around to various parts of the country, from base to base. It was when he was at Fort Bragg in North Carolina that he officially became a part of the 82nd Airborne. Specialist Mitch Trout, he was called, and he was my hero. And then the Gulf War started. My brother was going to Iraq. When Mitch left for Operation Desert Storm, my heart broke. 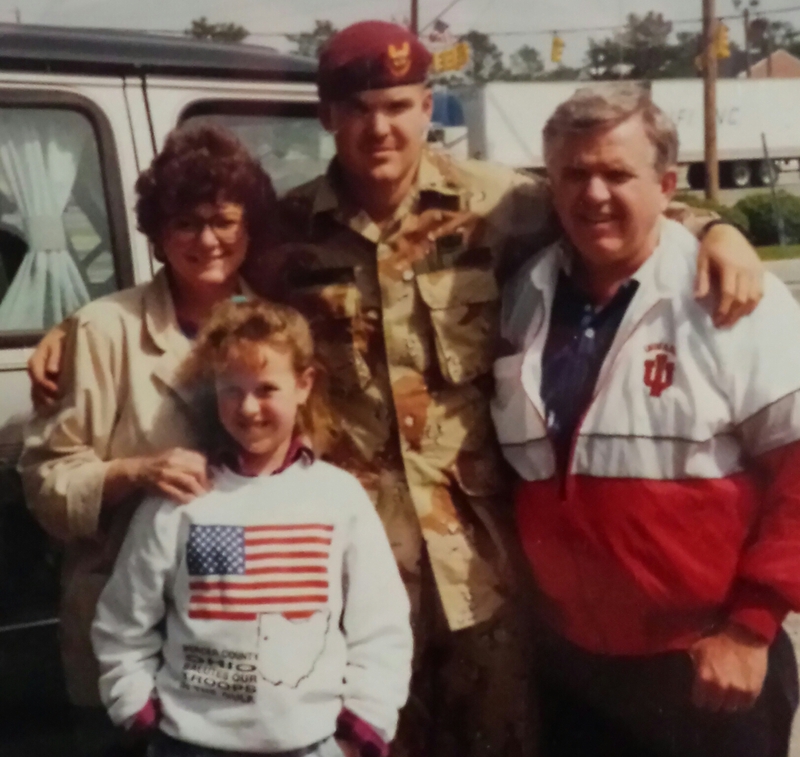 The Gulf War was nothing like what soldiers are facing today, but it was still important, still scary, and still heartbreaking for a 10-year-old girl whose big brother was fighting in a war. I wrote to Mitch a lot, sent him care packages, and prayed for him every night. That period of my life is probably the most patriotic I’ve ever seen the country. Maybe it’s because I was in a small town, but we all came together to support our troops. Everyone had yellow ribbons up to support the troops, whether they knew someone serving overseas or not. Patriotic songs like, “From a Distance” and “God Bless the USA” were common on local radio stations. I couldn’t hear either without bursting into tears, and even to this day, more than 20 years later, they are both still difficult songs to hear. Finally, after months of waiting, the Gulf War ended, and Mitch was coming home. It was the only time my parents got me out of school for a trip. We were going to North Carolina to welcome Mitch home from his time in Saudi Arabia and Iraq, and my oldest brother, Mike, was coming with us. We piled into the family van and took the road trip of a lifetime. I can still remember our first drive onto Fort Bragg, not sure exactly when Mitch would be arriving. Would it be that evening? The next day? The day after that? It was 1991, and it wasn’t like we had cell phones or email to communicate with my brother making the long journey home from Desert Storm. Feels like it was just yesterday that we entered the giant building holding hundreds of waiting family members. It was the most red, white, and blue I had ever seen at one time. People had signs, painted faces, and flags that made for one seriously patriotic bunch of people, all people waiting for their loved ones to come home. We had to check in at a desk to see exactly when Mitch would be arriving. Unfortunately, our spirits were a little low when we found out that his plane wouldn’t be arriving until the next day. I didn’t sleep well that night. My excitement was uncontainable. In a few short hours, I’d get to see my big brother. My hero. My favorite veteran. We got up bright and early and headed back to base. I had made Mitch a “Welcome Home!” sign, and wore my “Support our Troops” sweatshirt. My experience that day was one of the most emotional experiences I have ever had. It was so long ago, but the memory is so vivid. Waiting friends and family members gathered behind ropes and watched as the plane landed. Soldier after soldier filed off the plane from a distance, and they all looked the same. They lined up together, and someone gave a speech that no one really paid attention to. Every person there just wanted to find their soldier. It felt like an eternity before someone gave the signal for the soldiers to disperse, and the ropes in front of the crowd were dropped. Hundreds of people took off for the group of soldiers in front of us, screaming the name of their loved one. “MITCH!” my big brother Mike was yelling as I ran behind him. “MITCH!” I yelled behind him. Then we saw him, and it was the greatest reunion of my entire life. My big brother was home. He was back. He was OK.
Mitch was also very… stoic. It would be years before we really heard his tales of war from Iraq and Saudi Arabia. The day he returned was more about just being with him, and doing whatever he wanted, the first choice of which was to have lunch at Pizza Hut. There are many great veterans out there. Those who have served for a short time, and those who have served for a very long time. But my big brother Mitch will always be my favorite veteran. 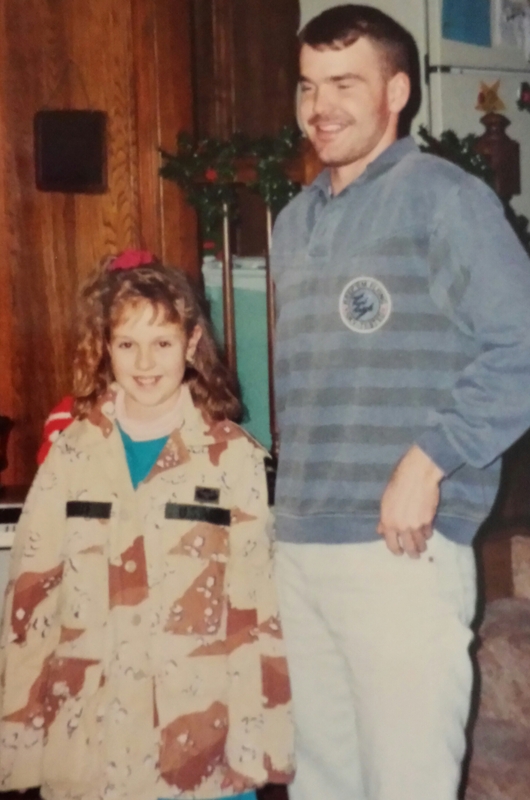 Being a little girl with your big brother away at war is a horrifying experience, but it certainly ended happily for me. Happy Veterans Day to all veterans! Thank you so much, and God bless you for your service. Yep, what an emotional time. As usual, You remember some things that I have forgotten about. Nice job !